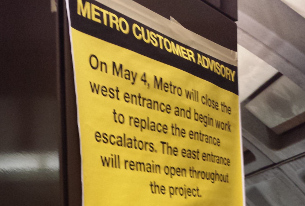 DDOT may have thrown a wrench into Metro’s plans to start work Monday on an escalator project that’s to close the west Van Ness entrance for the next three years. “I am putting WMATA on notice that all public space permits are suspended until further notice,” DDOT’s Matthew Marcou said. He spoke in response to an audience member’s question at last night’s community meeting organized by ANC 3F Commissioner Mary Beth Ray. Marcou, who chairs the DDOT committee that oversees permits to use public space for construction staging and other work, went on to explain that this means no trucks can bring any supplies or equipment to the site. It’s not clear how long DDOT can hold up the work in this manner. ANC 3F has asked Metro’s interim general manager for a delay until the closed sidewalk at the Park Van Ness site reopens at the end of this year. Marcou is no stranger to the community or that project. He, along with ANC 3F and developer Saul Centers, hammered out the traffic safety control plans that have closed the Park Van Ness construction site to pedestrians since late 2013. During a previous community meeting with DC’s Office of Planning last Tuesday, DDOT’s Ward 3 transportation planner, Ted Van Houten, revealed that DDOT wasn’t notified of WMATA’s plans until April 21st, the same day as the general public. Further, WMATA had not set up any meetings with DDOT before the planned closure of the Van Ness station entrance. At that same meeting, Council member Mary Cheh said she would be talking to WMATA and DDOT, and specifically asking DDOT about the possibility of a temporary sidewalk at the Park Van Ness site. Increasing crossing times for pedestrians at Windom Place and Veazey Terrace. Installing a “Barnes Dance” crossing which stops cars coming from all directions so pedestrians can all cross at once. WMATA sent Cedric Watson, its head engineer of escalators and elevators, to the meeting at Forest Hills of DC to explain the escalator replacement process. He sat at the table with the meeting’s hosts, the commissioners of ANC 3F, to make his presentation and work through the questions that the commissioners had asked him to address. Watson stated repeatedly that WMATA had notified the community about the work at an ANC meeting about 18 months ago, when a representative spoke about a five-month closure of the east entrance at Van Ness while those escalators were replaced. At the end, however, Watson acknowledged that ANC 3F had not been given a date for the west entrance project. He explained that constraints at this station required the estimated three-year closure of the west entrance. The removal of the escalator at the entrance will create a chute through which workers would drop sections of the three long escalators to the mezzanine level, some of the longest in the system. Much of the work can only be done at night, while the station is closed. They will also be doing electrical work and structural upgrades since the escalators have not been replaced since the station opened almost 35 years ago. Steve Strauss, deputy director of Progressive Transportation at DDOT, sat in the audience and asked whether closing the station over the weekends would have a significant impact on shortening this time frame. This was unclear but appeared to warrant further discussion. ANC Commissioner Sally Gresham asked whether the entrance stairway could remain open. Watson said that might be possible if it remains structurally sound. Asked about delaying the project for for eight months, Watson said that this would impact the timetable for the contractor, which will tackle the Cleveland Park escalators after this project is completed. He said that station would see an entrance closed for three years, as well. Medical Center, Woodley Park and Friendship Heights are other red line stations due for escalator replacements. Watson also said the decision to delay the project, or move forward with it, ultimately rests with Jack Requa, the interim general manager at WMATA. 3F Commissioner Malachy Nugent captured the frustration and anger at the meeting in his comment stating WMATA gave higher priority to working with the contractor than getting input from the community and warned that an injunction was not out of the question. This got resounding applause from the audience. It was clear that WMATA did not consider the impact on the community. But after the community meeting, the tone changed. DDOT’s Marcou and WMATA’s Watson set up a meeting for the next day. And Ann Chisholm, WMATA’s head of government relations, told me that Metro needs to do a better job of outreach. To see Metro’s advisory addressing questions about the work itself, see wmata.com/vanness. The “barn dance” is actually called a Barnes Dance named for Henry Barnes, a traffic engineer, who promoted them. In this case, it probably doesn’t make much sense since the pedestrian traffic in each direction isn’t sufficient. The other options are more reasonable.